Remove crusts from the bread loaf. 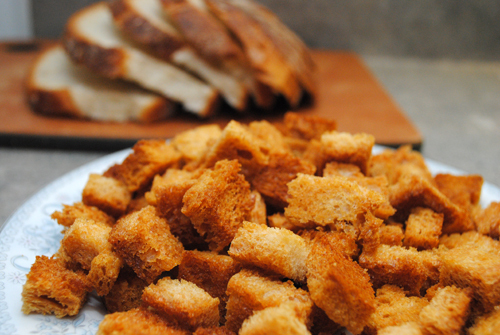 Slice bread into 1/4-inch cubes. Preheat the oven to 300 degrees-F. Arrange the bread cubes on an ungreased jelly roll pan (cookie sheet with sides). Drizzle with clarified butter and stir bread to coat. Bake for 20 to 25 minutes, stirring frequently, until bread is browned. Serve with soup or salad. Store in airtight container or plastic bag.